"Welcome to River Valley R.V. Park’s Website. We are very excited to be able to showcase our RV Park to you and invite you to come stay with us as our guest. We enjoy our business because we enjoy meeting people." We are delighted to have this opportunity to share ourselves with you. As a privately owned Park, we have a unique personal interest in our patrons and the quality of their stay with us. The size of our Park is intended to keep the atmosphere quiet and relaxed. We are committed to your comfort, providing impeccable cleanliness, and maintaining eye-catching beauty. At River Valley you come first. You’ll want to make this your home away from home. Our family began the dream of River Valley R.V. Park in the spring of 1997. Our love of people and the joy of creating beauty, initiated the process of turning a farmer’s hayfield into the Park you see today. The beautiful layout of the Park and building were designed and built by Marv, with the help of family and friends. The River Valley R.V. Park became fully operational for the year 2000 camping season. Over the next decade we built up clientele as Snowbirds began to find us and make our Park their summer home. In 2010 we added five private seasonal sites. We also began the process of making all of our sites into full-service sites. In 2011 we completed our second addition to River Valley RV Park, which included 12 more sites and another washroom facility. We also completed the changes needed to make all 48 sites at the Park to be fully serviced. The additions to the Park are each designed differently, attractive in their own ways. Be sure to also check out the images of our beautiful park on our Gallery Page. We chose the location of River Valley R.V. Park for the convenience and accessibility to you our patrons. We are located just 15 minutes from Saskatoon, Saskatchewan, on the twinned Trans Canada Highway 16 West, which is also known as the Alaska Route. 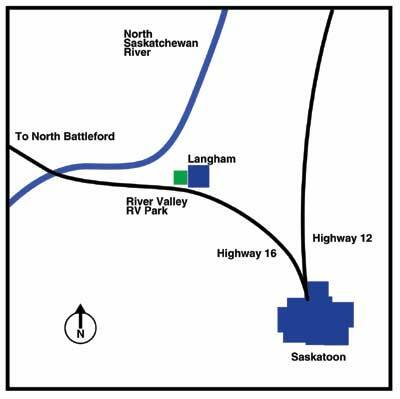 On the edge of the Town of Langham, River Valley RV Park is waiting for you! River Valley R.V. Park is close enough to Saskatoon for easy commuting to and from the city. We also get you out of the city for a good start in the morning on your journey without the hassle of the traffic. Situated close to a gas/diesel station, convenience store and a restaurant, you can park and stay, not having to drive to access these services.